(1867, London – 1939). He was an English book illustrator. At the age of 18, he worked as a clerk at the Westminster Fire Office and began studying part-time at the Lambeth School of Art. In 1892 he quit his job and started working for The Westminster Budget as a reporter and illustrator. His first book illustrations were published in 1893 in To the Other Side by Thomas Rhodes, but his first serious commission was in 1894 for The Dolly Dialogues, the collected sketches of Anthony Hope, who later went on to write The Prisoner of Zenda. 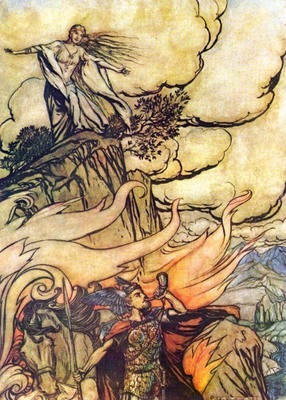 Book illustrating then became Rackham's career for the rest of his life.